Figure 35.10. sFLC concentrations in 745 patients with early diabetes mellitus. Circles: diabetic patients without MGUS; diamonds: diabetic patients with MGUS; crosses: normal controls. (Hutchison, Expert Opin Ther Targets, 2008; 12 (6): 667-76, copyright © 2008, Informa Healthcare. Reproduced with permission of Informa Healthcare). Figure 35.11. κ sFLCs in 745 patients with type 2 diabetes correlated with eGFR [[type=r|id=780]]*. eGFR was calculated using the Modification of Diet in Renal Disease formula ; (p<0.001). (Hutchison, Expert Opin Ther Targets, 2008; 12 (6): 667-76, copyright © 2008, Informa Healthcare. Reproduced with permission of Informa Healthcare). Approximately 30 years ago it was noted that the urinary excretion of κ FLCs (and the κ FLC/albumin excretion ratio) was significantly higher in type 1 diabetes mellitus patients than in patients with non-diabetic proteinuria . Subsequently, the same authors suggested that elevated FLC/albumin excretion ratios were an early indicator of diabetic nephropathy. They directly implicated a renal cause of the FLC leakage rather than excess production and their finding of normal sFLC concentrations supported this hypothesis . Mechanistically, hyperfiltering glomeruli leak more albumin which competes with FLC removal in the proximal tubules thereby displacing it into the urine (Section 3.5.2). In a more recent investigation of urinary FLCs in obesity and diabetes, Thethi et al. found higher urinary concentrations in obese (n=442) versus non-obese, type 2 diabetic patients (n=195). Higher concentrations were also found in obese patients with diabetes and hypertension compared with those without these conditions. Hutchison et al. studied FLC concentrations in both serum and urine of type 2 diabetic patients, to assess their utility as an early marker of diabetic kidney disease. It was clear that diabetic patients had raised serum and urine concentrations of polyclonal FLCs before overt renal impairment developed (p<0.001) (Figure 35.10). κ sFLC concentrations were higher than λ sFLC concentrations but only 1.9% of patients had a monoclonal gammopathy of undetermined significance (MGUS; Chapter 13.). 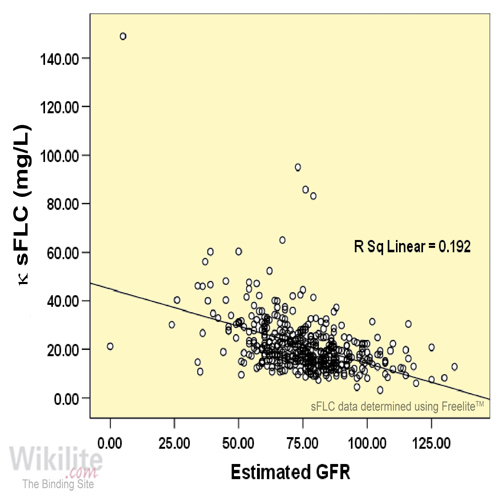 A good correlation existed between sFLC concentrations and various markers of GFR, including serum creatinine, cystatin-C and eGFR (Figure 35.11; λ sFLC data not shown). South-Asian diabetic patients had higher sFLCs than Caucasian diabetic patients, a finding that was independent of renal function and suggestive of underlying inflammation. In the same study , 68% of patients with normal urinary albumin/creatinine ratios (ACRs) had abnormal urinary FLC/creatinine ratios. Nevertheless, there was a degree of correlation between urine FLC concentrations and urinary ACR (κ FLCs: r=0.32; p<0.01 and λ FLCs: r=0.25; p<0.01). However, some patients had normal eGFR with high concentrations of sFLCs indicating increased production, and again, suggestive of generalised inflammation/vasculopathy. Perhaps retinopathy and nephropathy are the most readily observed clinical signs of a generalised inflammatory process that is correlated with raised FLC production. In a further investigation of the same type 2 diabetic population , higher ΣFLC concentrations were found in patients who experienced cardiovascular disease events within 2 years of follow-up. In multivariate analysis, a ΣFLC concentration of >57.2 mg/L remained significantly associated with cardiovascular events even after adjusting for age, albumin/creatinine ratio, diabetes duration or treatment . Aberer et al. extended this work by demonstrating an association of ΣFLC concentrations with the extent of carotid atherosclerosis. Since polyclonal FLCs are potentially nephrotoxic, increased concentrations may contribute to progressive nephropathy. It has also been suggested that monoclonal FLCs may play a role in some patients’ renal disease . Indeed, mesangial monoclonal FLC deposits observed in renal biopsies of patients with renal impairment are sometimes similar in appearance to those found in diabetic glomerulosclerosis . Thus, type 2 diabetic patients have significantly raised concentrations of serum and urinary polyclonal FLCs before overt renal disease occurs, and measurement of polyclonal FLCs could provide a useful tool in early diagnosis of diabetic kidney disease.